Boca Sombrero is an exclusive ocean front paradise embedded in the amazing rainforest settings of Costa Rica’s Osa Peninsula. 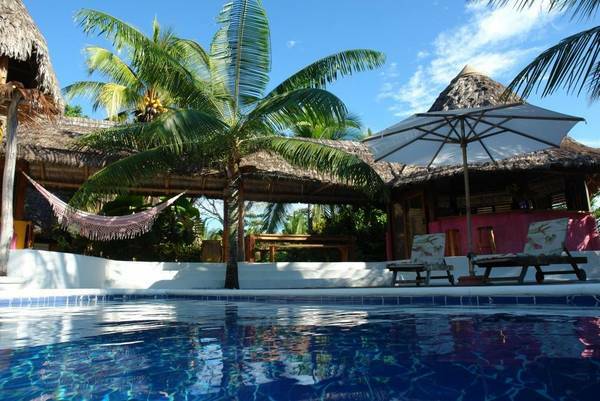 This property specializes in group events that usually combine Yoga practice with surfing perfect waves in the lush tropical setting of our beach. When we are not hosting a group or retreat, each of our accommodations rents out to individual groups and families. Our wide range of accommodations allows you to choose one of our luxurious beach front villas or one of our more modestly priced thatch roof tent platforms. We also offer a wide variety of activities that will give you the opportunity to explore the rugged beauty of this unique part of Central America while kayaking, climbing trees, rappelling down waterfalls, or simply zip-lining through the forest canopy. Of course you are also welcome just to relax by the pool, have a spa day, a massage, an acupuncture or one of the many other treatments offered by the therapists of our small cosmopolitan local community. Here in Boca Sombrero we are dedicated to making your stay with us as exciting, pleasurable, and healthful as possible. And remember, the best surfer is the one having most fun!